Here's a pink for Breast Cancer Awareness month! Actually, it's kind of a "fail pink." China Glaze came out with 50 different "Cremes and Glitters" also called the "Specialty Collection" that came out in 2009. Now, I had heard some rumors that the glitters were supposed to all be minis going to the Japanese market only, but frankly I've never seen any truth to that. Much to my wallet's dismay, I purchased every single one of them, and yet I still haven't swatched them all. There are a ton of good ones though, although many of the glitters are best layered over a creme in my opinion. Bad Kitty is a pink that settles between Barbie and bubble gum. It has a multicolored fine glitter that runs through it, but it's not as easily seen unless the light hits it just right. I used a base of Seche Natural, 3 coats of Bad Kitty which still left a VNL (visible nail line) and a top of Seche Vite. Because this is a true glitter, it was hard to remove and required extra time, patience and a bit of scrubbing. In the sun you can really see the VNL showing. The base is a very watery pink which is why I think this would be best layered. 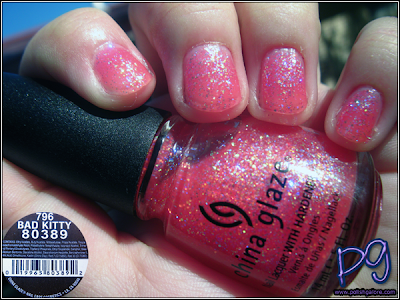 China Glaze has MANY pinks that would be appropriate - some from the Specialty collection itself. In the shade you can see all the glitter that I talked about. It almost gives the polish a foiled look because there is so much glitter packed into the base. Overall a very cute color to wear but not necessarily a fall color.